My name is Marlene Boegli, and Charles Boegli is my brother. Charlie worked for years on a product for use on human toenails, but I didn’t pay much attention to that, other than using it when I needed it. I am a martial arts instructor, among other things, so having decent looking feet is important. But my real love is animal welfare. I have rescued horses, sheep, goats, dogs…. Pretty much every animal that needed help, I rescued. Most rescues follow a pattern. Dogs have skin problems. Horses have foot problems. Draft horses have both. The problems are not necessarily why they need help, but following a few months or years of neglect, the problems are usually pretty extreme. They are very expensive, too. My greyhound, Sage, racked up over a thousand dollars in vet bills, and we hadn’t managed to help him at all. I suspect rescues have much bigger bills than this. But just paying money doesn’t help the animal, and for some animals there isn’t really an answer. Steroids and antibiotics make the animal more comfortable – for a while – but they don’t fix the problem. With horses it’s even worse. Hoof infections are often not even recognized, because very few people – vets and farriers included – even know what a healthy hoof should look like. Tenderness is not seen as a health issue, and is instead treated by shoeing. Like steroids and antibiotics, it helps for a while, but overall it makes the problem worse. So when Charlie developed this (it took a good long time; it turns out you can’t just mix things together if you want it to work) my first thought was whether or not it could help Sage. His skin was a ropy mass of scars, and he had a raging ear infection that seemed untreatable. Three baths, and he was comfortable. Hair started to grow back. His ears stopped draining. Wonderful! But one dog doesn’t mean you have a cure. At the time I didn’t care much. Sage was OK. Then Sage (who was deaf) blundered over the invisible fence, and ended up in the middle of the road. He was picked up by a kindly passerby, who called me to tell me where to get him. As I drove in, I could see the horses – beautiful horses – in their stalls. I was invited by the trainer to come and ride. About the third week, I came in to find one of the horses cross tied, owner in tears. They had tried everything they knew to try, and he was still lame. He had black, smelly drainage running from his frogs, and had been developing a surly attitude for a few weeks. The owner was afraid to ride him, and the trainer didn’t know what to try next. She knew what the problem was, but they had pretty much exhausted the options. Care in this barn was extreme. Stalls were matted, bedded with straw, and cleaned every day. They were picked most evenings. This horse had his feet cleaned daily, but realities of even a good barn meant that unless the owner drove to the barn every day, his feet weren’t going to get cleaned more than once a day. He was well fed, had pasture time, and was ridden regularly. But he had awful thrush. The owner had paid eighteen thousand dollars for the horse, in addition to board – not cheap in this barn – and now she couldn’t ride him. He was even getting nasty about having his feet picked. I had a couple of vials of Charlie’s formula in the car, I said. Would it be worth trying? Anything would be worth trying. I painted his feet, and left a couple of vials to use in the next few days. They weren’t needed. Four days later his feet were non tender, dry, and they seemed to give him no problem when he was under saddle. The retired barn stallion was also lame. Might it work on him? He was a much tougher problem. He had been retired for many years, and although he was trimmed regularly, picking a stallion’s feet daily isn’t necessarily possible. His feet were bad, and had been bad for many years. His frogs were bad, although the feet were otherwise OK. It took a couple of months, but he was soon comfortable. His frogs never regrew normally, but they no longer bothered him. After that we went through the barn, horse by horse. Not every horse had foot problems, but those that did improved rapidly. 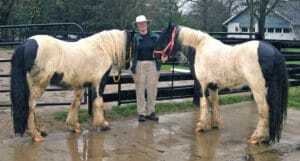 Two had been retired because of hoof issues, and both were returned to service. Three were in shoes, and were deteriorating slowly. All three became sound without shoes. One was a legacy filly, with feet so soft she couldn’t grow. Her feet are now beautiful, and she stands sixteen hands. We tested Charlie’s product for three years to be sure it worked. Will it work for you? If your horse has an infection-related problem we believe it will. We realize it seems expensive. It costs a lot to make. 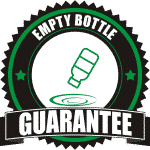 But the cost per bottle, or per application, isn’t the issue. A vet call isn’t cheap, either. Shoes are expensive. You can pay for these things and still have a lame horse. If the lameness is infection-related, vets and farriers might not have anything to help. 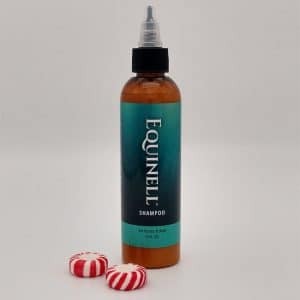 You don’t need a vet or farrier with Equinell™ Hoof and Mane Oil, although you can have your farrier apply it at trimming time. We believe you will discover it saves much more than it costs. I believe in Equinell™ Hoof and Mane Oil, because I have seen what it can do. Whether your horse is your partner, best friend, or livelihood, you want him sound and comfortable. And when you find time for a ride, that soundness is priceless. Marlene Boegli has spent a lifetime with horses. Beginning at age 7 she rode whenever she could, and bought her first horse at age 10. Since then horses have been a steady presence. Riding and training eventually became rescuing and training. 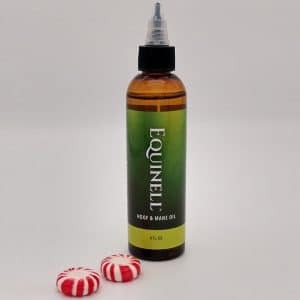 Working with Equinell™ Hoof and Mane Oil seemed a natural development, because while she could only rescue one horse at a time, she saw many horses lost to hoof problems. Now she can help many horses at the same time. Marlene graduated from the College of Mt. St. Joseph, with a degree in nursing, in 1984. She is an Ohio Master Gardener and teaches martial arts. She lives in Loveland with her husband, Dave, and has two children, Rose and Alan.